Male hooded merganser with crest raised. Photo by Josh Silberg. This small duck has a distinctively puffy, rounded crest​ that enlarges the appearance of its head. The fan-like crest makes the head look round when it is raised, and elongated when it is flattened. In either case it contrasts strongly against the bird's thin bill. The male's head and crest are black with a white patch on either side that fans out when the crest is raised. The male's breast is white with a black band, contrasting with cinnamon-coloured sides and a black back. The female and juvenile plumage is less distinctive: brown and grey, with a darker back and a cinnamon-coloured crest. 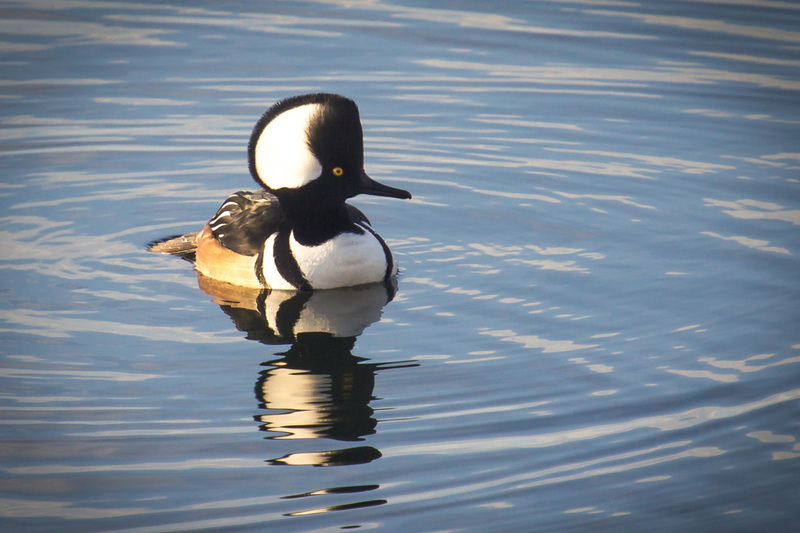 The hooded merganser is found on the Central Coast year-round. It inhabits rivers, creeks, ponds, and lakes in wooded areas; in summer it nests in tree cavities near waterbodies, while in winter it expands its preferred habitat types to include freshwater and brackish estuaries as well as protected bays along the coast. It is found across much of southern Canada and the US at various times throughout the year. Click here for a range map. The white head patch combined with the large crest distinguishes the male hooded merganser from other ducks with white head patches, like the male bufflehead (Bucephala albeola). The female and juvenile are similar to the female and juvenile common merganser (Mergus merganser) and red-breasted merganser (Mergus serrator); both are larger, have solid orange bills, and have shaggier or shorter and less inflated crests. This species practices brood parasitism within its own species: females often lay their eggs in the nests of other hooded merganser females. This means that while a single female does not usually lay more than 13 eggs in a clutch, many more can be found in a single nest — up to 44! Hooded merganser Lophodytes cucullatus. Audubon Birds. National Audubon Society. Accessed 06/04/2016. Hooded merganser Lophodytes cucullatus. The Birds of North America Online (A. Poole, Ed.). Ithaca: Cornell Lab of Ornithology. Retrieved from the Birds of North America Online. Accessed 06/04/2016. Dunn, J. L. and Alderfer, J. (Eds.). (1999). National Geographic Field Guide to the Birds of North America. (3rd Ed.). Washington, D.C.: National Geographic Society. Pp. 46-47.